Alcoholism, drug addiction, and psychiatric treatment programs always know who the employers are of their patients. It's one of questions on any intake or admission form. But I bet these treatment programs aren't calling you to let you know that an employee of yours was admitted to the treatment program, right? Why not? Do not say it is because the patient didn't want to sign a release! The reason is because the treatment program didn't ask the patient if they wanted support and help from their EAP--you. The treatment program isn't "thinking" about how you can help the patient (employee), how it can have less program stress by you assisting with follow-up, and how it can reduce recidivism while creating a win-win through collaboration. You will have to teach them. And if you do, you will raise your utilization rate with your most valuable clients -- alcohol and drug addicted employees in recovery. Imagine that anytime an employee from one of the major companies you service with an EAP was admitted to an addiction treatment program, that the treatment program would look to see if the patient had an EAP, who the contact person for that EAP was. They would then encourage the employee to use the program and then incorporate the EAP in the discharge summary. You would then be called and included in the important follow up information pertaining to the employee's recovery. 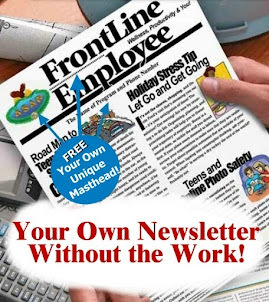 Employee referrals to you of this nature will increase your utilization rate by becoming clients so you can do follow up. When you contact addiction treatment programs, provide them with a list of the organizations you serve. Let the treatment program know that you are willing to follow patients (employees) discharged from treatment, and assist them in remaining motivated to follow-through with their recovery programs while problem-solving workplace issues. Addiction treatment programs are more than willing to ask patients for permission so you can be contacted. You can then involve the employee with the EAP and schedule post-discharge follow-up at the EAP office. This approach improves success rates of patients because the treatment experience becomes less isolated; the EAP is involved and a linkage to the job setting is established. In some cases, employees have been enabled for years, and return to the workplace is a complete set-up for relapse without your help. 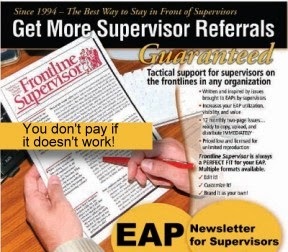 The EAP can play a mitigating role with a back-to-work conference, and other support. 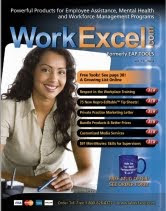 You can purchase for a specially designed set of "back-to-work" conference guidelines for EAPs at the www.eaptools.com web site. Find it on this page below along with other fact sheets for EAP managment.